Cafe and office staff took the opportunity to give the place a face-lift while Justin, Mel and Katie were retreating in Indonesia. The place has never looked so alive, overflowing with ingenuity, and a smart new menu set on a cafe designed blackboard. We’ve increased our staff by 50%! After five months of training up what is now our highly qualified barista staff (really! based on feedback from customers), we had an intense hiring round in April. We recruited some of the best and brightest to learn from our best and brightest. We now have seven dedicated cafe staff, including our newly appointed cafe supervisor – Sean. We’ve also hired on two part-time Kinyei office staff members who focus their efforts on administrative, accounting and project specific work. We’ve loved having a full and lively office! It won’t be long before we’re going to have to relocate to accommodate the growing project staff. Team Kinyei in June 2011 - we're growing! Recently the entire barista team – Sakana, Untak, Sopheap, Sakhey, Sotheareak and Sean – had the awesome opportunity to learn alongside Kinyei volunteers extraordinaire and Mel’s dear friends, Mikey and Ariana. June and July saw coffee making focus groups, hospitality trainings and team building workshops led by the Melbournite team of two, intimately familiar with coffee shop culture. 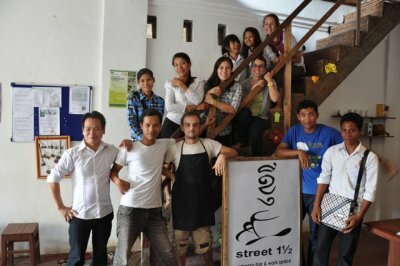 Thanks to their expertise, the Kinyei cafe team enhanced their confidence in communication skills, milk steaming techniques, and smart operational practices. A huge thanks to Mikey and Ariana for their tremendous job in the cafe – and of course for the crafting ideas. Macaroons and an old family fruit cake recipe are now available! Check back soon and we may even feature some of the food experiments we’ve been having fun with – eggs benedict and poached pear french toast. Not bad additions to your morning latte! Soksabike is gearing up for a blow out tourist season. We’re entering a new chapter in the development of a new 2 day community development education cycling tour and just yesterday hosted 20 applicants for an information session on what it means to be a tour guide with Soksabike. A recruitment drive, the creation of a multi-day tour, and potential partnerships with local, national and international businesses means that the Soksabike project has been anything but quiet this rainy season. Kinyei also recently hosted the Pepy Tour folks for an information sharing session about our projects. We’re also excited about a social impact survey we recently undertook to gauge our footprint on the local families and industries we visit. A huge thanks to Jan, a Soksabike supporter from Germany who stopped in Battamabang for 2 weeks on his cycling journey through South East Asia to help research routes and stops for Soksabike’s new tour. Sammaki opened its doors to the public with a bang in late May. Over 200 showed up, a good mix from all over – Battambang, Siem Reap, Phnom Penh, and Sisiphon. Since its launch in May, the community gallery and studio space has been bustling with people piling in for workshops, Sunday tea parties, lectures, and educational crafting with local youth groups, in addition to the daily foot traffic from tourists passing by. None of this would have materialized without the endless energy of the founding members, and local artists who have come together to make possible the vision for a community space to appreciate and celebrate art. The latest news is the exceptional solo exhibit by newly minted resident artist, Bo Rithy. His show, Mother’s Sweat was a tribute to his tireless mother who braved the daily plights of poverty in Cambodia to raise her family. Have a look at the show. We’re thrilled with the success of Sammaki since the concept of community-run /community-engaging spaces aligns with the core of Kinyei’s vision. We’re especially excited that it’s getting so much traction in the national press. Pretty rad, guys! 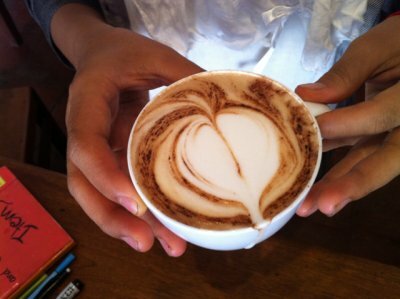 Kinyei staff are honing their latte art skills for Cambodia’s barista championship coming up in October. 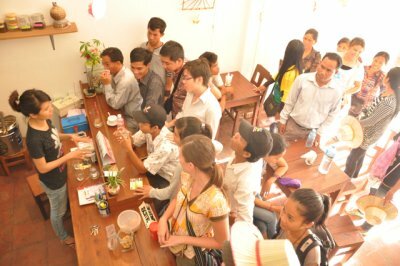 We’ve also been encouraged by the requests we’ve gotten for our staff to train new baristas in cafes in Siem Reap and Phnom Penh. How can you stay involved? Interested in being an expert-in-residence? We’d love to host short or long terms visitors with skills or knowledge they want to impart to our teams and/or projects. Contact us! 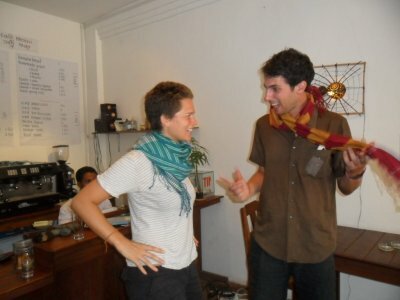 This week we launched our Kickstarter campaign to raise money for the Kinyei Cafe! We hope to raise $8,500 to get the cafe up and running. The cafe will provide hospitality training and employment for local at risk youth. The upper storey of the cafe will be used as a venue for local art, music, and collaborative learning projects. The profits from the cafe will go towards start-up costs for further locally-run social initiatives. Imagine cycling the roads of the Cambodian countryside, sampling local Khmer cuisine, and delighting in the charm that is Battambang! 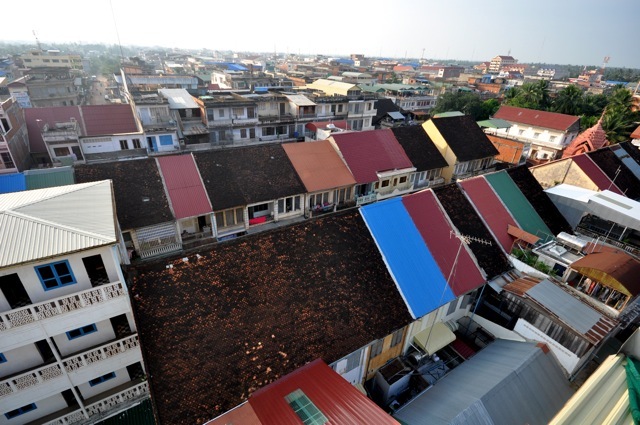 We’re sharing our spectacular “tour de Battambang” itinerary, your ticket to enjoy all the pleasures of this Cambodian paradise, with donors who pledge $2,500 or more.